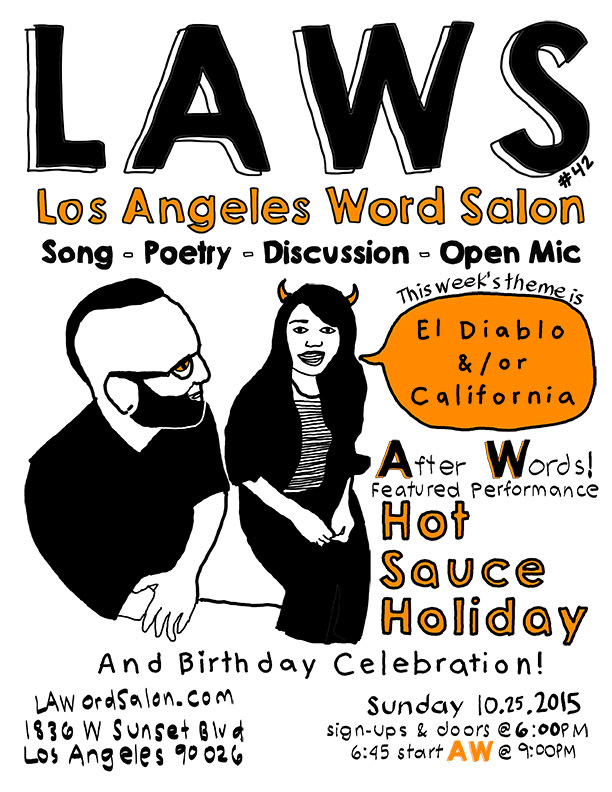 LAWS #42 El Diablo and/or California w/ Hot Sauce Holiday featured [A]fter[W]ords is this Sunday in #echopark! This week’s theme is El Diablo y/o California! PLUS!! We will celebrate the B I R T H D A Y S of Johnny O, Rafa, Mike G, and Lorna! PLUS PLUS C O S T U M E S welcome! Join us for the 42nd LAWordSalon at 1836 Sunset Studios (formerly Rafa’s Lounge) in Echo Park. It’s an art gallery, music venue, bar! Cool!